Maternity clothes are inevitable when pregnant, whether you end up being all belly, or you end up gaining weight everywhere, you will need some form of maternity clothes unless you have some kind of life where you never leave your house and live in your sweats all day (sign me up! ), but most of us at some point, have had to wear maternity. I ended up in maternity pants (jeans and leggings) really early on, they were more comfortable and I just liked them over using the hair-tie trick. Tops have kind of depended for me. Some are still too big for me to fit in, and a lot of my regular tops also still fit pretty good. 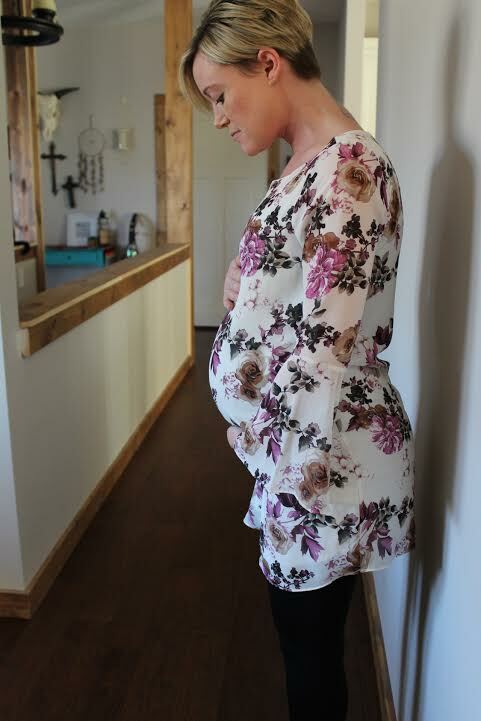 For me I really have enjoyed buying maternity pieces that I can wear again when I'm not pregnant. It just seems like the frugal thing to do, plus a lot of the stuff I've got is really cute and I can't imagine only wearing when I'm pregnant. One of the funnest tops I've got this pregnancy is this super cute bell sleeve floral tunic from Mommylicious Maternity! 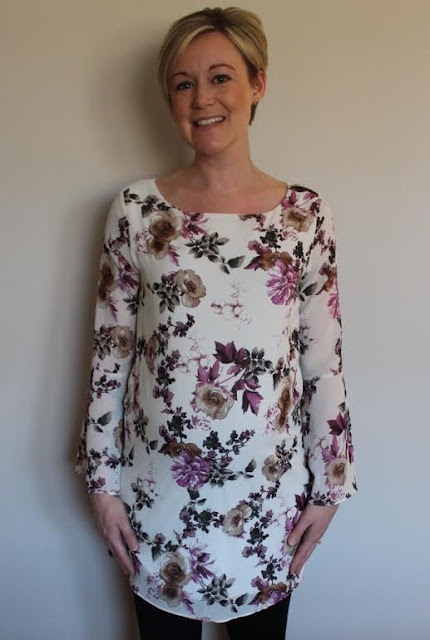 Although this particular top is no longer available, there are several other super cute, practical, and totally stylish tops, dresses, scarves and more on their site! They even have some gorgeous nursing bras and maternity lingerie. This particular top I chose because, one, I loved the pattern, two, I knew I could wear it again even while not pregnant, and three, it can be dressed up with black leggings and heels, or it can be dressed down with some jeans and a pair of fringe boots. I like versatile pieces that I can get a couple different outfit options out of and I think this top is perfect for that. Super cute!! I wore a lot of my maternity stuff after delivering for a while but eventually after losing some more weight (a good thing) they just hung down too far in the front. I kind of had the same thought as you though. This one is so gorgeous!